As a young mother, I used to be proud of my multi-tasking skills. Let's do it all. 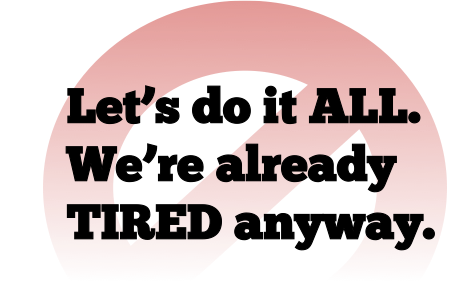 We're already tired anyway. So I looked after the kids, freelanced in various capacities, learned web design, cleaned the house, cooked the dinners, fetched, carried - why not do it all? There was SO MUCH I wanted to do ... and anyway, come what may, it was a stage in my life when I was going to be tired at the end of the day whether I did the other things or not. But once I started writing, multi-tasking just didn't work. You can't write a novel if half your brain is planning dinner. You can't get into character if you're checking your emails. You're not writing if you're tweeting. You can't multi-task, even if it's multi-tasking about your novel. You can't immerse yourself in a scene and work out another chapter at the same time. You can't develop a character while trying to think of a new twist in the plot. You've got to tackle things one at a time. Otherwise you're not doing that moment in your story justice. If you're not fully immersed, you're just writing notes about an idea. You have to surrender to the story. No, not just to the story, to the chapter. No, not just the chapter, but to the moment in the chapter. And only then will your characters come to life. Thank you - but it's wisdom learned through bitter experience. I beg to differ! I have written eleven full length novels in 12 years and many shorter things too with radio 4 on in study - yes, talk radio! My children are grown but often return. I blog once a week on Book Maven and once a month on History Girls, as well as running that site, booking guests, organising competitions and generally troubleshooting. And I'm on Facebook and Twitter and checking other blogs like this several times a day. I often "do my rounds" on the Internet halfway through a sentence! It's just a case of temperament, not circumstances. Well that's just amazing, Mary! It's funny this business isn't it - you feel so angry with yourself when you haven't exploited every opportunity to do EVERYTHING. I've learned the one way forward is to give myself a break. One small thing at a time gets you far. Solidarity, Vanessa! I absolutely agree. I have a part time job in law and two children. I write picture books, partly because I love them, but partly because it is far easier to write 800 words in between school runs and karate runs than a novel. I do a lot of my work on the tube commute, scribbling away at all kind of ideas. It works well. But every time I have tried to write something significantly longer, I find I simply don't have the head space to really get under the skin of it. So my plan is just to relax and enjoy what I write for now - and to give myself a break: it's ok not to do everything. It's OK not to do everything!!!! That's going to be my new motto ... when I was on the last stages of writing my current WIP I had to force myself not to think about all the other things I wanted to do, just get into a zone where it was just me and the words. And that included not thinking ahead - not thinking about the enormity of the three or four chapters I had yet to go. So true! That's why those precious uninterrupted moments are such bliss because you can lose yourself in your writing. I am always my worst enemy and I have to fight not to interrupt myself! Head space is crucial. Too many tugs and a story can fly apart and needs gathering up all over again and again. Timely and pertinent post, Candy and HUGE congrats on finishing your novel! Thanks Addy - goodness gracious it was such a mountain. After three years, I'm demob happy. Here's hoping my editors like it. Ohhhh...so THAT'S why I'm not getting anywhere with my novel! :) In fact, of course what you say makes total sense. I just was hoping that it wasn't true for me. Guess it is! Personally one of my problems when writing a novel is that I am always plotting ahead. So while I'm working on a scene, my mind is wandering ahead thinking how I would resolve this or build to that. Which means the scene in the moment comes out feeling half baked. It's really hard to overcome - harder even than turning Facebook off. This is so true! This is why some writers rent log cabins deep in the woods or on remote shorelines. To surrender to the story, you have to shut out the world! Which explains why I've not written since last April. Note: you cannot build a house and write a novel. Can. Not. Be. Done. Having said all that, I can't write for more than three hours a day! Congratulations Candy! Enjoy your break. I hope that the publisher loves your MS.
Oh I hope so too Amanda. Thank you! Hmm, not sure if I agree. In general I like writing in fits and starts. Half an hour and then go and put the washing on. Another half an hour and then walk the dog. I think total immersion is counter-productive for me. I wallow around and my work-rate slows. I suppose I write like this because I had to when I had the day job, so my first 3 books were mostly written in 45 minute bursts before I woke everyone else up at the start of the day. Or maybe I just have a butterfly mind... Each to their own, I say. P.S. Huge congratulations on finishing your book. Another mountain climbed. Thank you for the congrats, I am pleased but now on tenterhooks, waiting for a response! I replied to this earlier but my reply seems to have vanished ... I try to work in 20 minute bursts - literally using a timer. I tell myself to do just the one thing in that 20 minutes - say, sort out a plot twist or work on that character's voice. And then when the timer goes off, I have the option to go on and do something else, take a break, or set another 20 minutes! I have to agree with Rachel here, in that I work better in bursts. Everyone is different in their creative habits and you need to find the rhythm that works for you. Even though I work in bursts, I can only work on one book at a time, whereas I know other writers who have a carousel of works in progress that they select from depending on their mood! I heard of a writer who wrote two books at a time. The way she did it was by having two computers, one for each book. So she was able to quickly get into the headspace she needed by changing work tools! What you don't realize when you set off on a book is the length of time it takes to write one! And all your hopes and dreams are on this one thing which takes forever to finish. If you are keen to write up another book idea, you have to struggle with your impatience to finish the current and get on with the next one. You are your own worst enemy. So learning to block all those nagging desires is a useful skill. I think it's also easy to forget, after you've finished a book, how much blood, sweat and toil it actually took. I had a great idea this morning for a new book in the series I'm currently writing, so I put it in my notepad and there it will have to stay. Not much point planning a series if you can't finish book one! I've also learned the hard way that I can only write one thing at a time; more than this, I can only have one big thing going on in my life at a time, even if the others aren't writing. The trouble is that everything else is so distracting, the last few months especially! It really is about having the total willpower to switch everything else in my mind off so I can focus. I was very tempted by hypnosis at one point. Teri, I heard a programme where an actor said he had himself hypnotised so that he could relax before every performance ... and it worked. But I'm scared. Having said that, Katy, you have to admit that mumhood is good training to develop the grit and the stamina to write! Hey, Lockwood, can you guest blog on your anti-procrastination technique? Good for you, Tania! Sometimes we just have to give ourselves permission to do the one thing. Very true, Candy – I also think that being a mum has changed my work for the better and given it a few extra angles, once I do actually get the time to write. I'm not saying that you have to be a parent to be a good writer, because of course that's not true, but I definitely feel my writing has improved as a result. It's just finding the time that's a problem! I agree. Even the birds in the garden can destroy my thought process. This is a great piece. I work in bursts during the day (breaks help problems to resolve themselves), then total immersion at night. But it's taken me a long time to work out that's what works best!